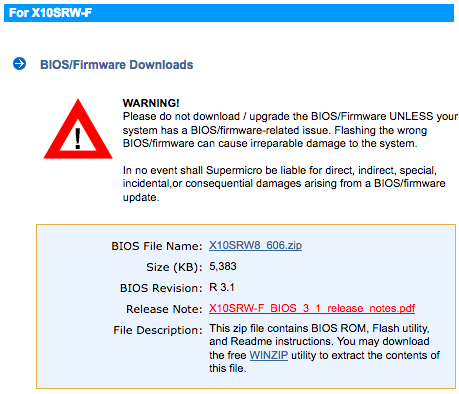 In no event shall Supermicro be liable for direct, indirect, special, incidental,or consequential damages arising from a BIOS/firmware update. 1. Updated CPU microcode to address ‘Spectre’ derivatives (CVE-2018-3639 & CVE-2018-3640) security issue. 2. Changed BIOS version to 3.1. 3. Added support for IPMI IPV6. 4. Removed unsupported memory frequency options from setup menu. 5. Updated Broadwell-EP RC 4.4.0 release. 1. 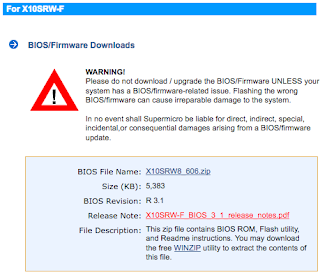 Save this BIOS update package to your computer. 2. extract the files from the BIOS package to a DOS bootable device (such as a bootable USB stick, or CD). 3. 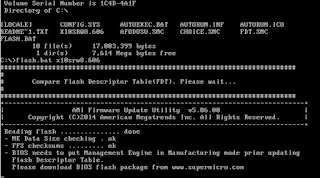 Boot to a DOS prompt and type FLASH.BAT BIOSname.### to start the BIOS update. a. If a different FDT is found, a new file, AUTOEXEC.BAT, will be created, and the system reboot will start in 10 seconds if no key is pressed. Press "Y" to go into system reboot right away. 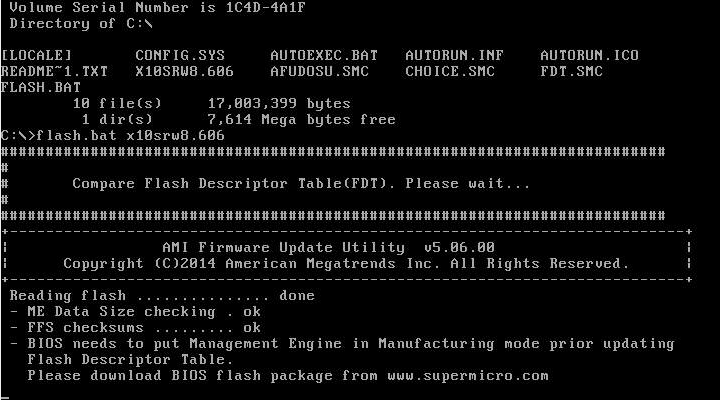 Continue BIOS upgrade with FDT programmed in next booting and schedules to reset system with 10-sec timeout message prompted. User can press <Y> for immediate reboot. After the reboot, the BIOS update will be continued. b. If the FDT is the same, the BIOS update will be started right away. No reboot will be needed. 5. Do not interrupt the process until the flashing is complete. 6. After the message indicating BIOS update has completed, do the A/C power cycle. 7. Go to the BIOS configuration, and restore the BIOS setting. What is all of this OF, FDT, UEFI and ACPI about?